We were recently approached by a leading Magazine for an article about Trade-Fair Tips for an Entrepreneur in the field of “Wholesale Home Decor”. “As a perfume brand, smell is obviously vital to your business model. What do you think other brands can learn from you about attracting customers to their stalls through sensory means”? You are absolutely right, it is all about the senses for us especially the sense of smell, but it is also very important to remember that people buy with their ‘Eyes’ also. When setting out your stand you are ‘Showcasing’ not only your ‘Products and Brand’ but also giving your potential customers, e.g. department stores and boutiques, an idea or glimpse of how it will look in their store. It is also very important to remember that in this age of ‘Online Retail / Multi channel’ selling, that you are able to offer your customers, high-res images and well written product information and a company background story. We are now truly in the age of ‘Bricks, Clicks & More’ retail and this also applies to online wholesale in the UK. 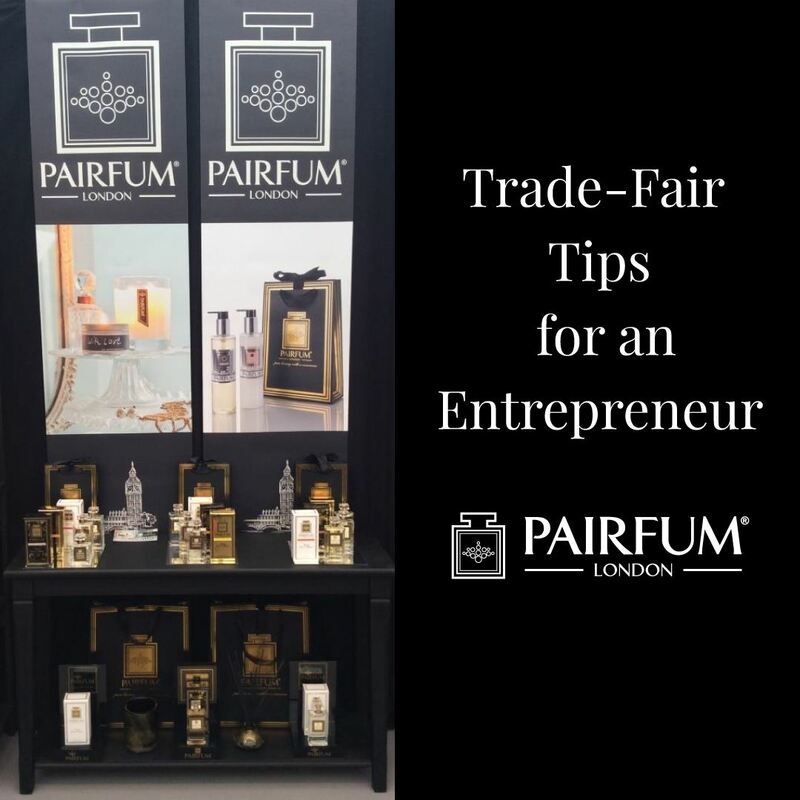 When setting up our stand we always display our products & perfumes for the customer to try, it creates a sensory experience and invites your potential customers to ‘Stop or Pause’ in their journey around the show. You would be surprised how may people have ‘Thanked Us’ for stopping them, as they were in the ‘Mind-set’ of having to see everything in a few short days and at the same time missing what could be their ‘Next Best Selling’ item. We have a wonderful example of a Gentleman walking past and telling us that he thought our stand and products were ‘Wonderful’, however he did not have time to stop as he was sent by his company to look for specific products and one brand in particular. He then continued on his way as he had a lot to do that day, we were delighted to receive the wonderful compliments and thanked him. About five minutes later he arrived back at our stand, red faced and laughing to say that ‘PAIRFUM’ was the company he had been sent out to find…. So,… our advice is to ‘Set out Your Stand or Stall’ to the best of your ability, always keeping in mind that we are all at some time or another ‘Customers’, and as such we love to have a wonderful shopping experience. similar products such as (small deco items, accessories, glassware / dinner ware, vases, jewellery, clothing)….. It is more difficult for retailers to select this type of item from ‘online only’ wholesalers which is why we believe the combination of ‘bricks & clicks’ is also ideal for the wholesale scenario. To arranging transport of the products (and brochures, etc) plus the show stand fixture & fittings. That is just the basic logistics. However, you must insure that you have spent time choosing which show to attend, and that it is the correct one for you. If it is the one for you – then you must insure that the ‘Hall’ or ‘Area’ within the show is the right section for your product category, e.g. there is no point being in the Jewellery section when you are trying to sell Food, home decor or stationary. There is no fool proof system or guarantee that a particular show is the right one for you or your product, but if you can visit the show as a visitor before ever attending as a supplier (some government bodies or Chambers of Commerce may provide, some financial help with this – It is always worth asking), then at the very least you have an idea what to expect and can avoid if possible making an expensive mistake. Once you have decided to do the show and you have booked your stand, then you must make sure that you let as many people as possible know that you are exhibiting, if you already have a customer base then send them a news letter with stand number, times, date and any other information you may have for example New Product Launches or Show offers. Have business cards, price-lists, brochures and samples (if available) – ready to hand out to potential customers. Once that is all done, you are 99% of the way there, and remember that fairs / shows mean hours & hours of standing on your feet, so even though the shoes you have go beautifully with the outfit you have chosen, … you will probably be glad to slip into a pair of flats later on in the day…. We always take or send our best sales people, as it is imperative that they know the product inside out, and enjoy meeting and greeting customers. It is also good to remember that no one knows your products or company better than you do.. When you are first starting out, you may not have the luxury of sending people along beforehand to set up the stand and display the products for you(not unless you are very lucky). So by contacting the show organisers and asking them what you have to do and what is or is not included in the stand cost, i.e. fixtures & fittings, electrics etc. (remember to make a list) do not be afraid to ask for help, as your fellow exhibitors who may be seasoned ‘Exhibitionists’.. are normally very helpful. It goes without saying that by setting up and breaking down the stand yourself, this is an extra expenses that you can avoid as a start-up or growing business. Yes, one of the nicest things about exhibiting in another countries is that you get to meet the people and experience the culture, and the differences between a show in NY & one in Tokyo is amazing, one is full of people who are for the most part shy and retiring and the other is – Well! NY. Don’t get us wrong NYC, is one of our favourite City’s in the World! This is also true of NYC. It was also more noticeable how the visitors to the US shows, were more willing to try something new and different. In other countries they are more reserved and may need to see the brand or products a number of times. we here at PAIRFUM, London’s Artisan Perfumers, wish you all the very best of luck.